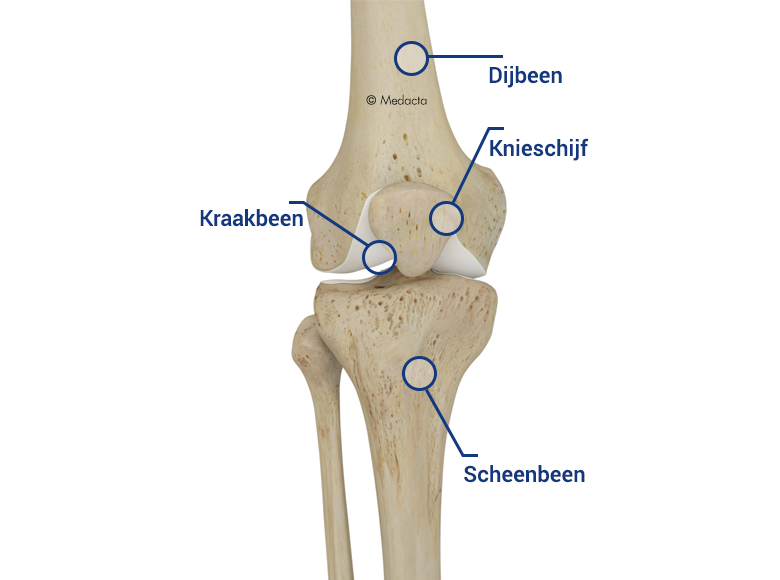 The knee joint is comprised of three bones: the thigh bone (femur), the shin bone (tibia) and the kneecap (patella). When you flex or straighten your leg, the thigh bone turns on the shin bone, while the kneecap runs along the end of the thigh bone. The leg movement is driven by the thigh muscles, the biggest one being the quadriceps, located in the front of the thigh. The thigh and shin bones are connected by ligaments, which give stability to the knee joint. The surface of the kneecap, thigh bone and shin bone, where the bones come in contact, is coated with a smooth tissue called articular cartilage. The cartilage, together with a substance called synovial fluid, prevents the bones from rubbing against each other and causing damage.